Today we will examine one more inexpensive professional sound card. The market of such solutions is growing at a great rate as to the range of products and demand. Fortunately, more and more ordinary users, not only musicians, turn their attention to such products, thus, preferring high-quality sound to low-grade multimedia stuff. Today in our lab we have an inexpensive (around $100) professional sound card named Maya44 from AudioTrak. This Korean company is not widely known yet. It's a new subdivision of Ego Systems Inc. (owner of EgoSys, ESI trademarks) which is a huge respectful manufacturer of professional sound equipment. Audiotrak was founded in order to produce and promote quality semiprofessional and multimedia sound cards of the middle price range ($100-200). 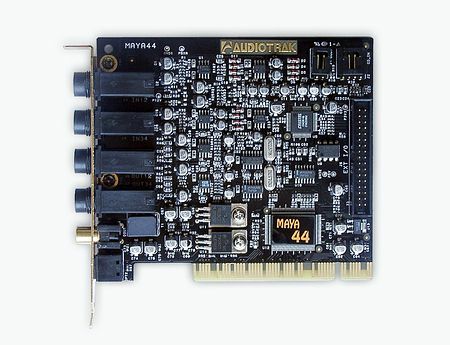 Apart from the 4-channel Maya44, Audiotrak offers the Maya 7.1 multimedia card with 8 analog-outs and a full set of drivers for DirectX applications, as well as the Inca88 system equipped with an external commutation unit with 8 stereo inputs and outputs. microphone preamplifier of 12V phantom power. The specification of the converters implies that you can unfortunately forget about the "24bit/96kHz" mode. The card incorporates the Crystal CS4298-KQ codec which is NOT positioned by the manufacturer (Cirrus Logic) for professional cards. However, the RMAA tests will show whether it makes sense to use these converters here. The card itself is of high quality, there is nothing to find fault with. All discrete component provided are also of high quality, they are similar to those used in expensive professional devices. The set of accessories follows the principle of minimalism: a big styrofoam box contains the card, a 50-page user manual in English, an Audiotrak's booklet and a diskette with drivers. Well, I haven't seen drivers on a diskette for a long time already. The card is equipped with no additional software; the drivers take only 150 KBytes. I must say that all sound cards from Ego Systems Inc. ship without any try&buy or shareware audio programs, not to mention full versions. On the other hand, you don't have to overpay for unnecessary software. The installation process was fast and flawless, a special icon appeared in the system tray at the end. However, you can download a newer driver version (3.60 against 1.20) from the manufacturer's site. The new drivers also take about 150-200 KBytes. The Audio Devices section in the Control Panel has received 4 new devices: 1-Maya44 2Ch Wave, 2-Maya44 2Ch Wave, 3-Maya44 SPDIF OUT, 4-Maya44 6ch Wave. 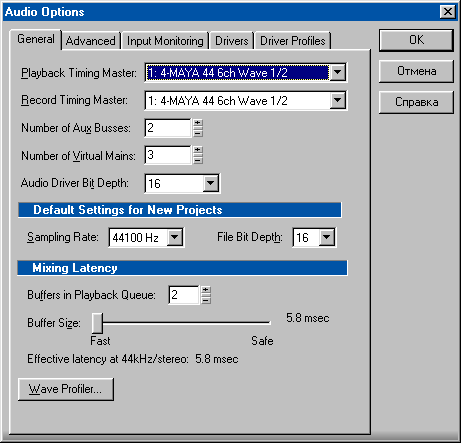 The latter device is meant for programs supporting the Multi-MME standard (for example, Cakewalk SONAR) - when this port is used by a usual program, sound goes through the 1-Maya44 2ch Wave. The panel provides access to all card's settings. During monitoring a signal level can be measured in 1.5 dB steps. Here you can also enable/disable a microphone preamp, a headphone amp, change a sampling frequency (only 44kHz and 48kHz are available) and latency. The routing of virtual wave devices to real card's outputs is a bit too complicated: the activated headphone amplifier directs sound from the Wave12-34 to both outputs. To make the first output monitor only the Wave1-2, and the second - only the Wave3-4 it's necessary to disable the amplifier and turn off the Wave3-4 monitoring button. If you understand how to do that, it takes no time. 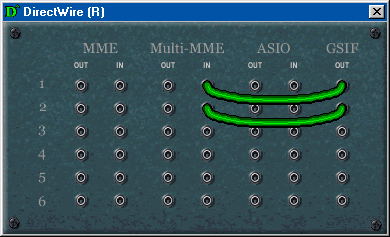 All available inputs and outputs shown can be connected with virtual cables. Here the 1.2 GigaStudio output will be directed to the Multi-MME input - apart from its playback this makes possible to record it in the SONAR. The DirectWIRE also allows recording sound from a WMA file, which is impossible in usual conditions (any attempt to output WMA files to a digital-out fails, as well as their direct recording onto a hard drive). Such scheme looks very handy and universal. 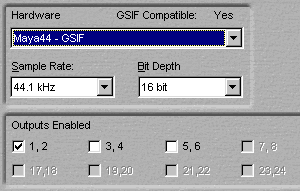 The GigaStudio easily recognized the GSIF drivers of the Maya44 and offered three virtual outputs. There were some problems with latency, but they were solved by setting it to 256 samples in the driver panel. The CPU utilization was very low, no playback problems or clicks were noticed. The Maya44 worked perfectly with the SB Live! 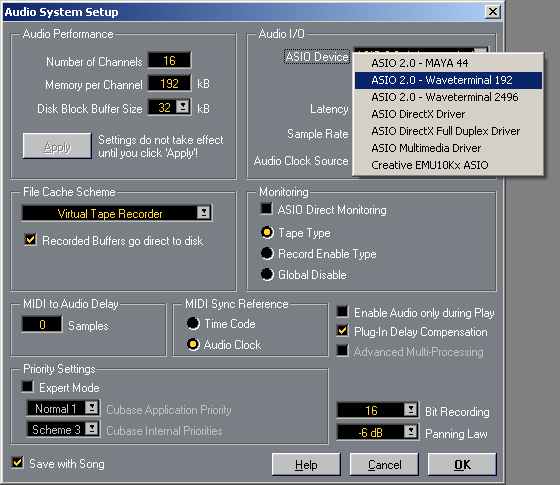 1024 installed in the same computer which was used as a MIDI interface - both cards had no problems in operation. When I studied characteristics of the CS4298-KQ codec I didn't expect striking sound from the card. This chip was released in 1999 as a universal audio and modem AC'97 codec; besides, it possesses some functions of 3D sound extension. As a rule, such things bring in nothing good. For subjective tests we used professional Sennheiser HD-250 Linear II monitoring headphones. We took several CDs with classical, hip hop and electronic music. The compositions were played simultaneously by two copies of the Winamp through the SB Live! and the Maya44 cards. I just had to reconnect the jack swiftly. However, quick reswitching wasn't so necessary, because it was clear that the compositions played on the SB Live! sounded definitely inferior to the Maya44. Flat, the clamped and plucked sound produced by the Live! came along with the lively and rich sound of the Maya44. The trip-hop vocals' croaking on the Live! turned into clear and beautiful sound on the Maya44... As far as peculiarities are concerned, I must note that highs are too smoothed down - I wish they were sharper. The signal sampling from an external source was good as well. The sound coming from an external CD deck was very clear - no signs of compressed or constrained notes which are typical of multimedia cards. 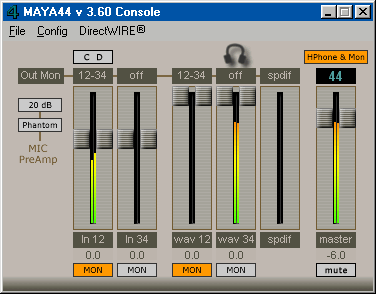 The Maya44 copes excellently with recording of a guitar and a signal from an external synthesizer. The microphone preamp integrated into the card is actually awful. When it's switched on the noise level is considerable - around -60 dB. When connecting the microphone the noise level added by the preamp is really high. The mic preamp integrated into the SB Live! is really perfect as compared with the Maya44. I wish it were a flaw of just the given sample. Unfortunately, we couldn't test the preamp on another sample. The objective tests of the card were carried out with the RightMark Audio Analyzer 3.4. The outputs of the card were connected to its inputs with a 20cm Proel's microphone cable with gold-plated connectors. First of all, we connected the first line-out of the card with its first line-in. It should be noted that the headphone amplifier is located exactly on the first output, the mic preamp is on the first input. The THD level has fallen down 4 times. The dynamic range has increased by almost 3 dB, and the noise level has dropped by 3 dB as well. The level of intermodulation distortions is now twice lower. Well, it would be better without this microphone preamp at all. In general, the card has impressive characteristics. It excels in the low-price professional niche, where the Hoontech STAudio DSP24 Value also belongs to. Now let's compare the card in question with its closest competitors: Midiman (M-Audio) Audiophile 2496, Egosys Waveterminal 2496, Hoontech Audio DSP24 Value, Echo MIA. The characteristics show that the Maya44 is much closer to professional solutions than to budget crippled models like Hoontech DSP24Value. Unfortunately, lack of the 24/96 mode (which is a limitation of the AC'97 codec used) makes it tenfold worse than the others in the list. In the control panel of the Maya44 we set latency to 256 samples and a sampling frequency to 44,100 Hz. After profiling the new device the Cakewalk Sonar defined latency of 5.8 ms. The Sonar backed by the Maya44 managed to stand the torture carried out with a multitrack composition which consisted of 10 tracks stuffed with Waves and TL Audio effects. The processor's load didn't exceed 25%. After that we added into the composition two DirectX tools: Tassman SE and Virtual Sound Canvas processed by Waves TrueVerb. The tracks were played synchronously. Finally we coupled the composition with the GigaStudio played tools - but it didn't confuse the card. However, such overload caused some gritting. By the way, the drivers of the SB Live! mix the same streams without any similar effects. Anyway, I do not recommend that a tool level be high for recording of compositions. When the tools are distributed correctly among virtual ports there is no gritting. The Cubase 5 recognized the ASIO drivers of the Maya44 without problems and set latency to 12ms at the sampling frequency of 44,100 Hz. The virtual tools with the sound tracks and the sound of the MS DirectMusic GM software synthesizer played flawlessly. The ASIO makes 6 devices available for recording and reproduction - 3 virtual ports of the Maya44, respectively. The universal E-WDM drivers are developed for operation in all Windows operating systems. That is why in the XP we installed the same 150 KBytes drivers of the 3.60 version. We also installed the EgoSys Waveterminal 2496 card which uses drivers of the same architecture as that of the Maya44 - E-WDM. We found no problems or compatibility errors! The GigaStudio 160 2.5 started buglessly and allowed choosing between the GSIF drivers of the Maya44 and Waveterminal. The Cubase 5.1 R1 operated flawlessly as well. Well, the Maya44 is perfectly prepared for operation in the WinXP. Any professional card takes tests with applications using DirectSound, especially games, quite painfully. It is not obligatory for a professional card to work correctly in applications it is not meant for. But we are testing devices in all possible modes. Fortunately, the Maya44 copes excellently with modern games. Surely, the card doesn't support any 3D positioning functions, but it mixes DirectSound streams without problems. First of all the Maya44 was tested in the Elder Scrolls: Morrowind and Dungeon Siege. We revealed no artifacts. In my opinion, the difference in the sound of these games between the Maya44 and SB Live! is almost lacking. Lack of the hardware reverberation and EAX 2.0 in the Max Payne was well noticeable. Nevertheless, we found no errors in sound processing. 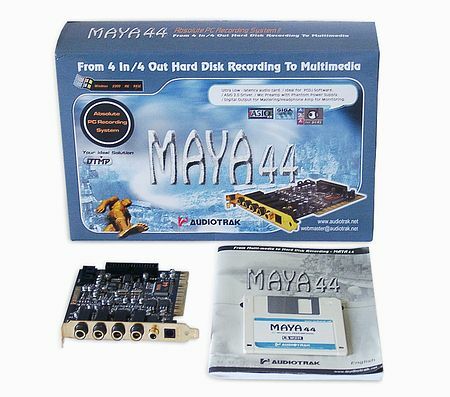 In short, the Maya44 is able to cope with sound playback in modern games using software algorithms of the DirectSound API. The Audiotrak Maya44 is a high-quality professional sound card. Besides, taking into account its price (which is $100 odd), this card will be a perfect choice for many. As compared with its closest competitors - Midiman (M-Audio) Audiophile 2496 and Hoontech (ST Audio) DSP24 Value, the Audiotrak Maya44 has twice more analog channels (both competitors have, in fact, a stereo-in and a stereo-out, except digital ones) and headphones support which is very important for a home musician. In the 16bit/44.1kHz mode its sound quality doesn't yield to the venerable Audiophile 2496 and outshines the DSP24 Value. Probably, lack of the 24/96 mode support is a great disadvantage for someone. On the other hand, it is hardly so necessary at home. Especially considering that such a data format sets high requirements to computer's power (it's recommended that the processor is not weaker than AthlonXP2000+). It means that you have to invest quite a lot of money here. In this respect, it makes sense to upgrade your computer up to some better card, for example, ESI Waveterminal 2496 or Waveterminal 192X priced at $250-300. In general, the Maya44 makes an impression of being a card designed specially for home use - starting from its price to some pleasant details. For example, apart from a coaxial output the card has an optical digital one specially for users of MD players. As you know, the sound re-recorded into an MD player through a digital cable has a clearer and louder sound. The card will be an excellent choice both for music listening (CD, mp3) and for composing in professional sequencers and editors.